I have always enjoyed reading writers’ memoirs, writers’ diaries, and writers’ thinly-autobiographical fiction. Some of my favourites include Octavio Paz’s Labyrinth of Solitude, where I found acute and subtle portraits of the character of a nation; Chinua Achebe’s There Was A Country, where I discovered a haunting political elegy; Dambudzo Marechera’s The House of Hunger, where I met a stinging literary critique of Negritude and Ngugi wa’ Thiong’o’s idea of language and literature; and Jack Kerouac’s Lonesome Traveler, where I traveled second-hand through some of the most brilliant landscapes imaginable. 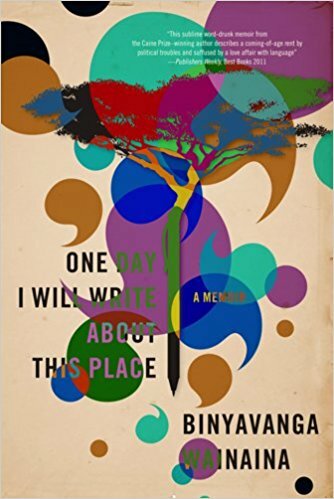 In Binyavanga Wainaina’s One Day I Will Write About This Place, I found all this and more. She twists past Jimmy, the ball ahead of her feet, heading for me. I am ready. I am sharp, and springy. I am waiting for the ball. Jimmy runs to intercept her; they tangle and pant. A few moments ago the sun was one single white beam. Now it has fallen into the trees. All over the garden there are a thousand tiny suns, poking through gaps, all of them spherical, all of them shooting thousands of beams. The beams fall onto branches and leaves and splinter into thousands of smaller perfect suns. I am disappointed that all the distant scenery, blue and misty, becomes more and more real as I come closer: there is no vague place, where clarity blurs, where certainty has no force, and dreams are real. The song comes to a full stop. A full three seconds of silence as rumba momentum builds. The choral voices are now a sheet of frenzied rubber, Kenya streeeeectches and bleats, held together by the military trumpets and cash crop exports, the future, only the future, laboring bodies, a railway, a mpresident. Moi and his cronies are on the radio daily. It is in the papers every day. These are dark days, we are told. There are dissidents everywhere. We have to all unite and silence the dissidents. From the radio, we know that foreign influenzes are invecting us, secret foreign influenzes are infringing us, invincing us, perferting our gildren, preaking our gultural moralities, our ancient filosofies, the dissidents are bushing and bulling, pringing segret Kurly Marxes and Michael Jagsons, making us backsliding robots, and our land is becoming moonar handscapes. 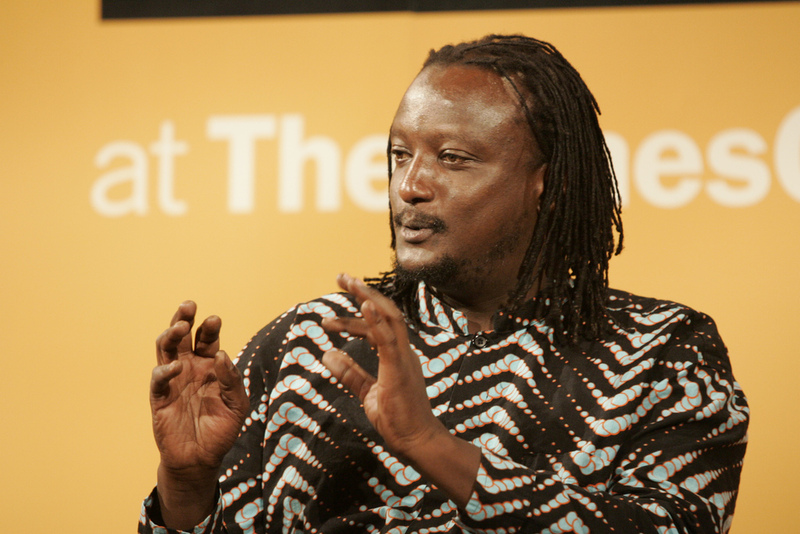 They took the rain away, the Maxists, the Ugandans, wearing Western mini sguirts and makeup, they are importing them, inserting invected people, these dissidents, like Ngugi wa Thiong’o, and that man called Raila Oginga Odinga. “But I cut the melons open with a knife so the buyer can see,” the “mule” responded. “Oh! Knives too, eh?” they exclaimed. Wood rots. Wood will not bend in heat. Wood burns and crumbles. Early this century. The searing heat of Belgium’s lust in the Congo insists on new metallic people. We, in Kenya, don’t understand the lyrics – we don’t speak Lingala – but this music, this style, this metallic sound has become the sound of our times. Our schooling machine – nationwide, merit-based, proud, and competitive – Kenya’s single biggest investment – is falling apart, and the new season sounds like Band Aid. It’s all over CNN. Open mouths and music, thousands and thousands of white people throwing food and tears and happiness to naked, writhing Africans who can’t speak, don’t have dreams, and share leftovers with vultures. But above all else, what makes this book is its use of language, the wizardry that Wainaina has in putting words together in an assemblage that make them feel more real than life itself. “None of us has her voice,” he writes about his mother. “It tingles. If crystal were water made solid, her voice would be the last splash of water before it set.” He might well have been describing his own writing.